Food images abound in Yale’s collections as well. 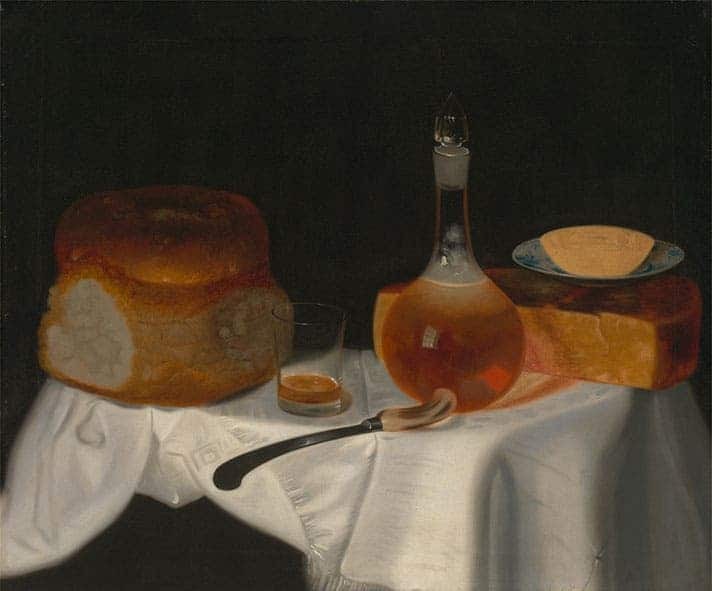 “Still Life of Bread, Butter, and Cheese” by William Smith, ca. 1754 is in the Yale Center for British Art’s Paul Mellon Collection. A recipe book from 1750s England in the Beinecke’s Osborn Collection offers 502 recipes in 14 categories, including “creams and cheeses,” “wet sweet meats,” “puddings and pyes,” and “possetts and sillibubs.” In case you’re wondering what a possett is, it’s a hot beverage of milk curdled with wine or ale. A syllabub is an English sweet dish described by the Oxford English Dictionary as “a drink or dish made of milk (freq. as drawn from the cow) or cream, curdled by the admixture of wine, cider, or other acid, and often sweetened and flavoured.” The bad thing is that the recipes are written in an almost illegible hand writing (with the notable exception of the hedgehog pudding, which no, doesn’t contain any hedgehogs). First of all, you’re instructed on how to cook a turkey. Still not convinced? Well, maybe I can change your mind with some pigeon pears, boiled rabbit with onions, broiled eel, and oyster pie? Pigeon pears (turkey alternative): Take your pigeons, bone them all but one leg, and put into through the side out at the vent; cut off the toes, and fill them with forced meat, made of the heart and liver; cover them with a tender forced meat: First, wash them with the batter of eggs, and shape them like pears; then wash them over, and roll them in scalded chopped spinach; cover them with thin slices of bacon, and put them in bladders; boil them an hour and a half, then take them out of the bladders, and lay them before the fire to crisp; then make for them a ragout. 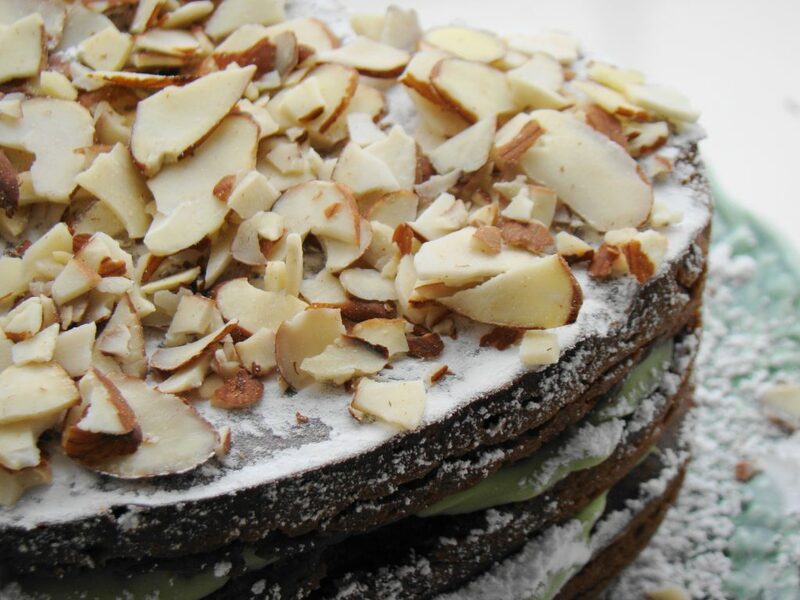 mmmm… almond cake! Image via Wikipedia. Preserved cherries (cranberry sauce alternative): Pick the cherries, and take out the stones; put to every pound of cherries, a quarter of a pint of the juice of white currants, (first passed through a jelly bag) and the weight of both liquor and cherries of doubly refined sugar; sift the sugar and sprinkle it as you put them into the preserving pan, which you must boil and scum (skim), till the cherries look clear; then put them into glasses. Almond cake:Take a pound of almonds, blanch and beat them exceeding fine, with a little rose of orange-flower-water; then beat three eggs, but only two whites, and put to them a pound of sugar sifted; put in your almonds, and beat all together very well; butter sheets of white paper, and lay the cakes in several forms as you please, and bake them in a cool oven.